We humans pride ourselves on our cultural diversity, but we’re not the only creatures that form unique societies. Turns out, two clans of sperm whales living near the Galápagos Islands speak different dialects — offering yet more evidence that animals have culture, too. 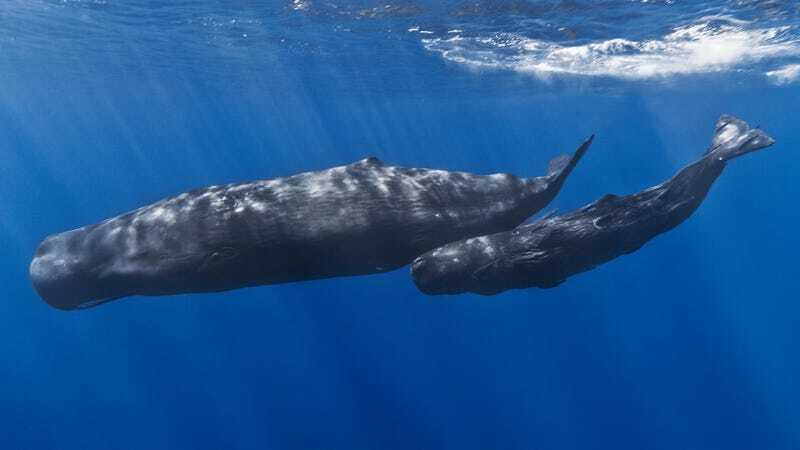 Sperm whales — massive, deep-ocean hunters that live in hierarchical social networks — communicate with each other through a series of clicking repertoires known as “codas.” These vocalizations, which play an important role in social bonding, are not an innate behavior. Rather, young whales learn to communicate from their elders. In many ways, sperm whale communication bears hallmarks of human culture. But if codas are indeed a cultural trait, we might expect them to vary from clan to clan. That’s what PhD candidate Mauricio Cantor of Dalhousie University set about testing, by examining two famous sperm whale clans that have shared waters off the Galápagos since at least the 1980s. By recording the whales’ vocalizations with an underwater microphone, Cantor and his research advisor Hal Whitehead showed that the two clans are clicking to different beats. “In one clan we call the ‘regular clan,’ we heard regularly spaced clicks, but in another vocal clan that we call the ‘plus-ones,’ the coda types they make have an extended pause at the end before the last click,” Cantor told the BBC. Follow-up computer simulations revealed that these linguistic differences aren’t due to underlying genetic distinctions, but rather, the transmission of knowledge. The whales in each clan are learning from and conforming to the behavior of those around them. It’s not the first time we’ve observed this sort of cultural transmission in the animal kingdom. Behavior ecologists love to dote over the “potato-washing” and “stone play” behaviors Japanese macaques pick up when they don’t have to forage for food. Fashionista dolphins off the coast of Western Australia distinguish themselves from their Atlantic brethren by wearing sea sponges on their beaks. And in the African rainforest, chimps are busy flirting, grooming and arguing using incredibly complex sign language. Our anthropocentric compass may be blinding us to some of the most interesting cultures on the planet.